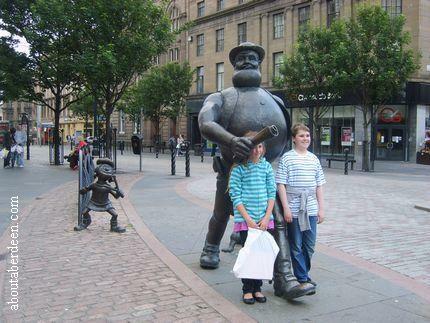 The Desperate Dan Statue in Dundee can be found in the city centre shopping area. 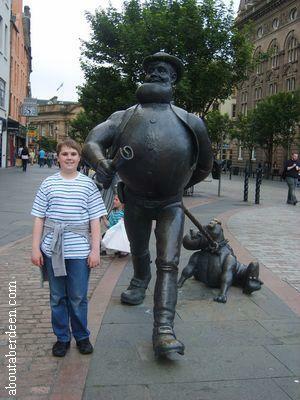 The Desperate Dan statue sits at 8 feet tall and is made from bronze. It was unveiled by the children of the Dundee High Street school. 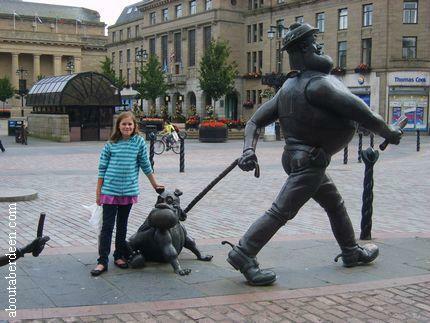 As can be seen in the Desperate Dan photographs on this aboutaberdeen page he is in a rush across Dundee Square whilst out walking his dog, Dawg. 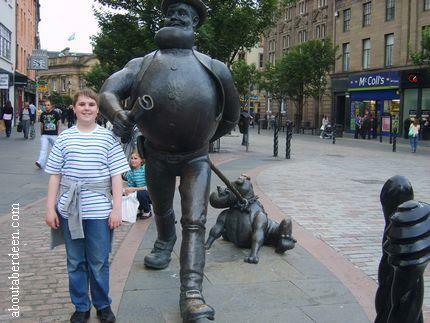 Behind the Desperate Dan Statue in Dundee is a character not from The Dandy but from its sister comic The Beano. She is Minnie the Minx and she is aiming her catapult. The large pillar on the right is of a big thumbs up. The Desperate Dan, Dawg and Minnie the Minx statues were created by sculptures and artists Tony and Susie Morrow. Desperate Dan appears in the Dandy comic by DC Thomson of Dundee, who also publish The Beano. Desperate Dan made his first appearance in The Dandy on the 4 December 1937. The strongman and cowboy lives in Cactusville and loves to eat cow pies with horns sticking out from the pastry crust. These were made by his Aunt Aggie though these cow pies have not appeared in comic strips for several years. Desperate Dan also has a nephew called Danny, a niece called Katey and once had a girlfriend called Little Bear. The first Desperate Dan comic strips were drawn by the artist Dudley D Watkins an early cartoonist for Oor Wullie in the Sunday Post. In recent years DesperateDan and Dawg appear in the revamped and renamed Dandy Xtreme with comic strips drawn by Ken Harrison.